I’ve owned a Lee Big Stopper 10-stop filter for almost 2½ years now and have become quite a fan of long exposures and the effects that this filter can produce. It’s become a staple accessory to many a photographers kit bag and it opens additional artistic opportunities to a landscape photographers day once those golden hours have disappeared. Prior to the Big Stopper I used a B+W 10 stop filter, which is of the screw-in type, but it’s not as convenient to use as the slot-in type. It also produces a strong colour cast, so has been consigned to my filter wallet ever since the Lee arrived. Going back even further still I purchased (at some considerable expense) a Singh-Ray vari- ND filter from the USA, which claimed to offer from 2 to 8 stops of ND when rotated, achieved by means of stacked, special polarizers. This worked reasonably well, but towards the 8-stop end you start to get interference patterns and at 14.5 mm thick it vignettes terribly. Singh-Ray now provide a thin mount version at 10.5 mm in thickness, which currently retails at US $390, but once you add overseas shipping, VAT and import duties, it becomes a prohibitively expensive piece of kit. There are a few alternative and much cheaper variable-ND filters now, many which you can find on eBay, and there’s also one by Polaroid you can find on Amazon. 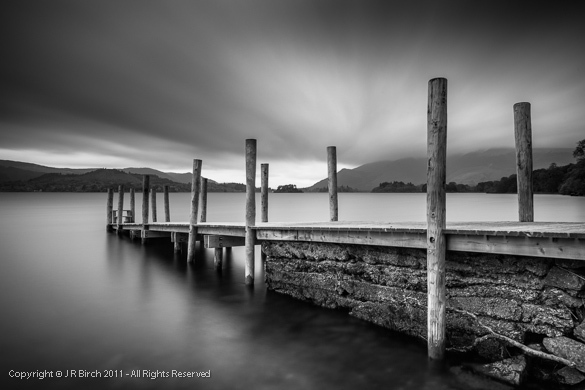 None however, seem to compare with the quality and results obtained from the Lee Big Stopper. The Lee Big Stopper, for those of you that don’t know, is really just a 100mm square piece of black glass, which reduces the light by 10 stops. You can just about see through it if you hold it up to your eye in day light. It’s not cheap either and now costs over £100. You will also require a Lee filter holder and adapter ring for your lens, both of which will push up your initial outlay to over £200. So what’s so special about the Lee Black Glass? Well, it’s about the only 10-stop filter that it is almost neutral and that doesn’t produce a strong colour cast. Even Lee don’t actually call it a ND (neutral density) filter because it’s not totally colour neutral, but it’s pretty close. The square glass filter has a thin foam gasket on one the rear to prevent light bleed when it sits in the 2mm slot in the holder. Being made of glass it’s a fragile piece of kit too, and I’ve seen several broken easily during transport inside camera bags and filter wallets, so it needs good protection. The Big Stopper has become a victim of it’s own success and demand is high. Production processes for the Big Stopper are complex and performed to strict tolerances and they are only produced in periodic batches. Last year Lee apparently had some production problems and soon you couldn’t get a Big Stopper for love nor money. Several batches have hit the shelves this year, but many of the major online retailers are still quoting waiting lists of up to 20 weeks. So rare have they become you’ll even find them going for more than double the usual retail cost on eBay, even second hand ones. And so to the reason for my ‘Shocker’ title. Yesterday I ventured out in the early hours, making a 2 hour drive to Spurn Point at the far extremity of the Humber estuary. This in the vain hope of a spectacular autumnal sunrise to shoot with my new 5D Mark-III. 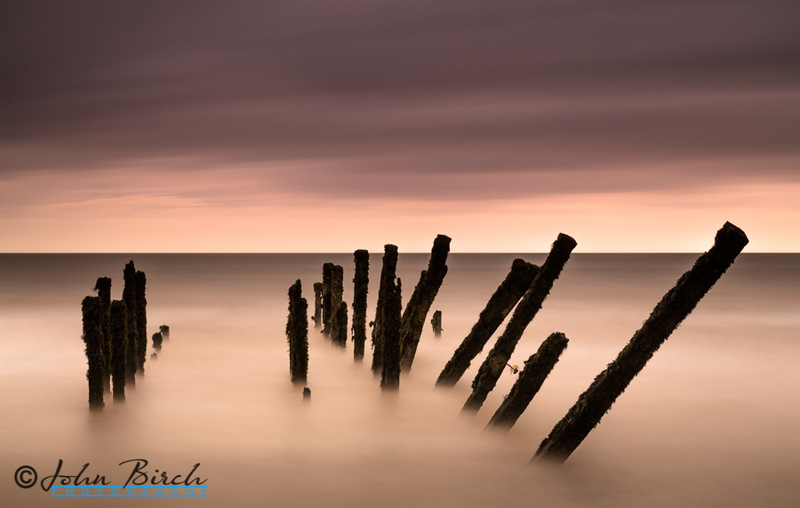 Spurn is a great location which has undoubtedly the best array of old, weathered, sea groynes, that you’re ever likely to encounter within the UK, so there’s lots to shoot with a Big Stopper even if that colourful sunrise doesn’t materialise. This was pretty much my story too. A few fleeting minutes of vaguely pinkish cloud, followed by typical drab, grey, overcast, cloudy, British skies. Time for the Big Stopper. The tide was receding fast but I still wanted that silky smooth water in my foreground. I was venturing slowly forwards, trying to find secure footholds for my tripod upon the boulders and concrete fragments (of once stout military sea defences) that are scattered along the beach. The waves lashed up against my wellies, then whilst trying to reposition, one slight unbalanced moment occurred .., a momentary wobble and as I tried to regain my balance … then clink, as the Big Stopper slipped from my filter wallet, onto the rocks and was washed away into the frothy foam, never to be seen again. Curse it! 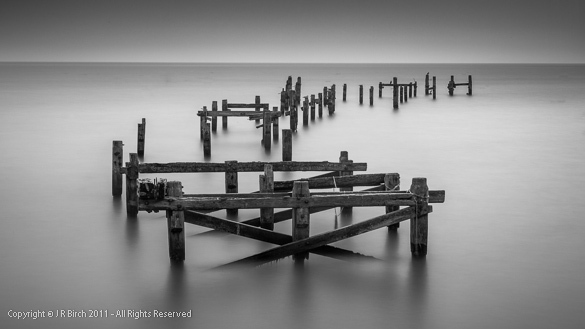 Thankfully I still had the B+W 10-stop screw-in filter in bag, which was duly promoted to operational duties. I found I had to keep taking on and off to just to focus. It worked, but what a pain compared to the Lee. If only I’d been more careful. I searched rather hopelessly amongst the rocks, but knew it was futile. My Big Stopper was probably shattered into several pieces and scatters over the sandy beach by now. I still enjoyed the shoot however, and perhaps got one or two good shots but couldn’t help feeling so annoyed with myself. A while later, when parked up near the light old house, I decided to ring around to see if I could get a replacement. I’d knew about the delays of course, but had no idea just how bad it was. I rang several major photographic retailers, and all quoted 3-4 months minimum. I tried a few others, but all presented a similar story. I even tried eBay but was shocked at the prices. Some people were obviously cashing in on sudden rarity. Then I recalled Teamwork, a great little outfit from whom I’d purchased my Hitech filters in the past. “Yes Mr. Birch we have just one left in stock” I couldn’t believe my luck. It arrived this morning. Now that is teamwork! Was it worth it, well this is my favourite photo from the shoot so you can decide. Likewise Allan, I also ordered one from a major retailer. Even after the quick delivery from Teamwork, I decided to leave the order open as the Big Stoppers are rather fragile and after the above escapade I think it’s worth having a reserve. Rather surprisingly the second Big Stopper arrived last week even though the outlet had quoted 20 weeks. Now I have 2! Thanks for the kind comments on my Iceland Gallery … what a place!